You are at:Home»ETF Strategist Channel»Buying the Dips: When Does this Approach Run the Most Risk? 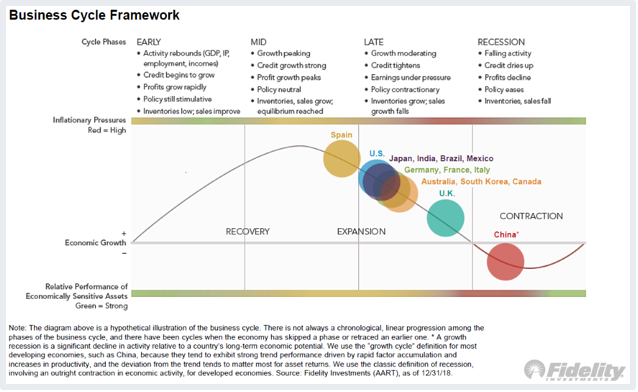 Fidelity, in their 1Q19 Market Update, has suggested that the U.S. is following many other global economic powerhouses into the late stage of the current economic cycle. As we’ve mentioned before, investors never truly know where we are in the economic cycle until enough time has passed and we can look back and define it with certainty. Often, we have entered and exited a recession before the data confirms a recession even existed. As we show signs of entering the late stage of the cycle, should we change our investment behavior? Will the historically successful “buy the dips” investment approach become too hot to handle? 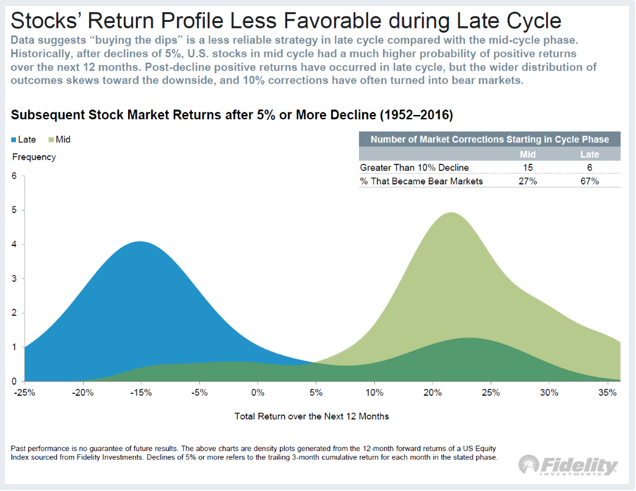 Historically, what the chart above demonstrates, is that if you bought the dips in mid-cycle (light green), your most frequent outcome over the next 12 months would have been a positive return and the majority of those positive returns would have produced double digit gains. Better yet, losses, if realized, would have been relatively modest. Bravo! Buy the dips confirmed! However, once we move to the Late Cycle stage, all bets are off. The blue color denotes the results of buying the dips in the late stage of the business cycle. Yes, positive, double digit gains are possible, but there have been significantly fewer positive outcomes and unexpectedly 2/3rds of the events have produced negative returns. Whoa! Picture this: you are an NFL coach. If you run a special play, it will give you a score most of the time and usually a touchdown. If the play is botched, the damage is usually modest. But in the 4th quarter, after you’ve run the play throughout the game, the odds change. Now you might score 1 in 6 times but the chance of a pick six against you jumps to 2/3rds. Are you still going to call the play? Are you still going to buy the next dip? For an alternative to buying the dips, read our piece, “Tactical to Practical”. 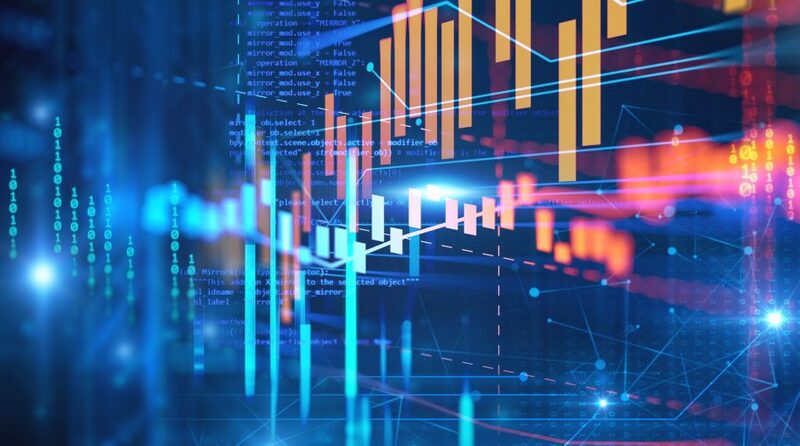 This article was contributed by Dave Haviland, Portfolio Manager at Beaumont Capital Management, a participant in the ETF Strategist Channel. For more insights like these, visit BCM’s blog at blog.investbcm.com.